The residential HVAC industry has been going thru many changes over the past decade or so in terms of the metal materials they use to make certain pieces of HVAC equipment. To give you some understanding first, there are two different separate type of coils that your HVAC system uses for your air conditioner or heat pump to work properly. The outdoor coil is the condenser coil, the indoor coil is the evaporator coil. This subject is primarily dealing with the indoor evaporator coil. Come with me on a repair call in which I repair a Freon (refrigerant) Leak in an all aluminum evaporator coil. (Watch video embedded below) I also discuss the copper versus aluminum debate in the video. This Katy, Texas AC blog subject for today is regarding the indoor coil or evaporator coil section of your residential HVAC system. Because usually, this part of the system starts to leak refrigerant more frequently than the outdoor or condenser coil. (Realize the AC refrigerant leak you may have could be in the outdoor coil just as much as it could be in the indoor coil: proper diagnosis must be performed, a guess is not a diagnosis. Just because an evaporator coil refrigerant leak is more common, doesn’t mean that this is where your refrigerant leak is. As of 2018 nearly all, if not all manufactures of HVAC equipment make all aluminum evaporator coils. Copper tube and aluminum fin evaporator coils are at the beginning of the end as manufacturers continue to cut costs from their AC manufacturing processes. All Aluminum Evaporator coils are often called a new way of doing things. Truth be known, this isn’t the first time the HVAC industry used all aluminum evaporator coils. (indoor evaporator coil, don’t get this confused by the spiny fin aluminum condenser coil of Trane / American Standard brands, which was invented by GE in the early 1980’s.) With that said, about 30-40 years ago Carrier made their air handlers with all aluminum evaporator coils. The difference now is that the technology is much better this time around, but not infallible. The problem with the technology back then was the connection point to the copper line set. They used a compression type connection to connect the line set to the evaporator coil. After some time this connection would leak. With no real way to repair this leak, the solution was to replace the coil with a copper tube and aluminum fin coil. You see when I say ‘copper coil’ I mean copper tube and aluminum fin. Manufactures to my knowledge have never made an all copper evaporator coil for residential air conditioning systems. That would be very costly, not to mention very heavy. The drive away from copper tube evaporator coils is in my opinion due mostly to cost of the metal and because it’s been determined that formicary corrosion is leading to increased failures of this type of evaporator coil this increases the home owners cost as well as the manufacturer of the coil, because as the coils have become larger due to equipment efficiency requirements, the walls of the copper tube to these evaporator coils have become ‘paper’ thin or very close to it, which gives little to no protection against formicary corrosion. To find out more about what formicary corrosion is and what it looks like watch the video embedded above. There are examples of formicary corrosion within the video. This type of corrosion effects all brands of copper tube and aluminum fin evaporator coils. The formicary corrosion attacks the copper part of the coil which causes it to leak refrigerant. High efficiency air conditioning has driven up material cost in recent years because requirements to increase efficiency have made coil sizes increase as well. More material = higher cost. It’s only common sense that by using cheaper materials a manufacturer (all manufacturers) can cut these material costs. So because aluminum is not effected by formicary corrosion, aluminum is the better coil material? Aluminum is a very reliable material. However, this does not mean an all aluminum coil will not fail ‘at some point’ due to refrigerant leaks. Remember we’ve been here before with all aluminum coils (30-40 years ago). While the technology now is considerably different and in my opinion much better than before, aluminum coils can fail (spring refrigerant leaks) just as much as a copper tube aluminum fin can. Watch the video embedded above if you think an all aluminum coil can’t leak refrigerant. I have installed many, many all aluminum coils over the course of my illustrious HVAC career (23 total years as of 2018). It is my opinion that all aluminum coils are a good replacement option in light of the formicary corrosion problem that is well noted and documented by the HVAC industry as a whole. However, all aluminum coils used as evaporator coils in your AC system are not without their own set of problems or short comings. While all aluminum evaporator coils are currently better than the copper tube and aluminum fin coils they are replacing and quite reliable this doesn’t mean they will not fail at some point. If a salesman is trying to sell you on a shiny all aluminum coil, realize nearly all manufacturers make an all aluminum evaporator coil. This feature is nothing special as of 2018. Refrigerant leaks have always been a challenge to one degree or another in relation to an AC system. The difficulty now is that your AC system must be refrigerant leak free due to the rise in cost of all refrigerants. The method of recharging systems without leaks being repaired is a method of the past. It is no longer cost effective to do these practices any more. If you watched the embedded video above demonstrating where this particular all aluminum coil failed, my personal opinion is that this coil most likely failed by some sort of corrosion because the coil sits in condensate waste water from air pulled from the home. It is unlikely this leak was cause by any other means. Because I install all my own equipment, is the reason I can say such things without a shadow of a doubt. Certainly there could be other reasons not yet known. If anything, this example in the video shows the complexity of this subject. There is no such thing as an air conditioning system that doesn’t fail, for one reason or another. You will always need a good reliable HVAC repair man. Maybe it’s me? So what can you do? Build up a service history with me. (CHECK MY SERVICE AREAS HERE) I keep track of things of this nature via your service invoice, if a particular coil is failing often I will attempt resolution by offering other solutions. Some manufactures are better at different things and or different configurations of HVAC equipment. Just realize this isn’t a gimmick as I know that all brands of equipment fail at some point, the idea is to limit or reduce the failures as much as possible. This is another reason why I sell more than one HVAC brand and these decisions are constantly being evaluated. I don’t just blindly keep replacing the same brand coil over and over again as it is my opinion this would result in insanity. Obviously this is ultimately your decision how to proceed, but I will at least attempt to offer another option that may give a better result due to my own personal experience in equipment choices I have sold in the past to other customers. Currently my failure rates of all aluminum coils (any brand) that I originally installed is less than 2%. Some AC brands I’ve installed the failure rate on the coils is currently 0% (it’s likely not a brand you know). While all aluminum evaporator coil failures do happen it’s not as often as you may think. Some equipment configurations are more susceptible than others. Thank you for visiting with me today. I hope your day is comfortable. My name is Ray Austin. I am the owner and operator of Austin Air Companie, a HVAC Service Company serving Katy, Texas | Cypress, Texas | Richmond, Texas and some surrounding areas. 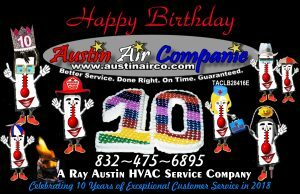 I am a Texas Licensed HVAC Contractor with 23 years ‘hands on’ experience in Air Conditioning and Heating Systems. I hold an AOS degree in HVAC/R, EPA universally certified to handle any refrigerant and NATE certified in HVAC installations and repairs. I specialize in Residential HVAC systems. Happy Birthday! Turning 10 years old in 2018. Has it really been this long? Better Service. Done Right. On Time. Guaranteed.